Finally we started a very interesting drama W the two worlds starting Lee Jong Suk and Han Hayo Joo. As always we were curious what will be the story. Though we had already read the synopsis a love revenge story of two worlds. A world of web toon and a real world. This sounds too interesting. The drama starts with the shooting Pistol game. 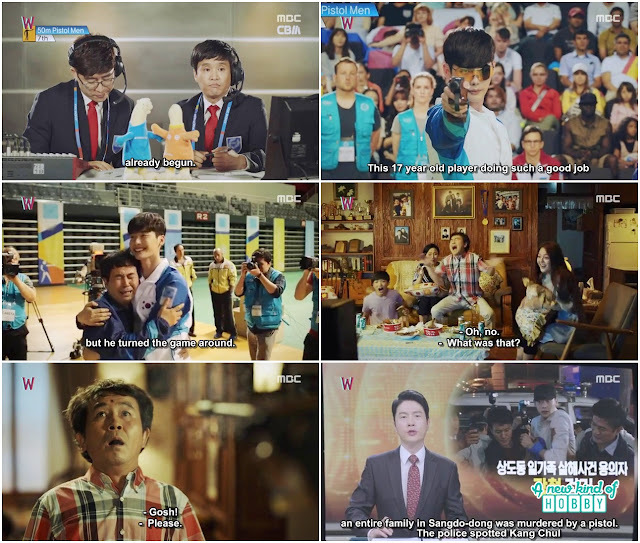 The moments were thrilling who will going to won, we guess it would be a sports based drama. This game was also new for us. Kang chul won the gold medal at the very last moment. He went home and found all his family shoot dead. Omo its the murder revenge story but Kang chul was arrested for murdering his own family. This was the breaking and shocking news. We thought the story taking another turn. How come the main character murder his own family on the day of his achievement. On the other hand the female Oh Yeon Joowho was a resident surgeon. The professor who had a bad personality and always yell and punish the resident, call Oh Yeon Joo and confirm are you the daughter of the famous web toon cartoonist "Oh Sung Moo"?. I am a big fan of him specially the webtoon series "W". I already bought all the 38 issues and read them its so interesting. I can't wait to knew who will be the suspect, ask your father for me. But Yeon Joo said my father has very strick rules he won't tell me anything regarding his work. The the doctor bribe saying "You have never open a chest in a surgery, have you?" i will let you do it. She was sure her father won't let her knew what will going to happen in the last episode. The professor doctor was really a leech he said "I will let you to close the chest also" then she said ok i will try to get a clue. We were confuse about the first scene of the murder but thought may be in further episode that thing will continue and the truth will eventually reveal. Oh Yeon joo call the assistant Park Soo Bong and wanted to ask a favor. But he said i was going to call you your father was disappear. We all are worried because today's the deadline we have to submit the data to the editor. Then Yeon Joo got all worried and came to the office, everyone there said there they haven't seen President Sung Moo leave the office. She searched his office to find out his wearabouts. Seeing his mobile phone, wallet and car keys there they had bad thought may be he got kidnapped. Yeon Joo taking a peek at other things and saw the last drawing at the screen where the hero was dying on the way out she feel some one grab his coat and suddenly she disappear into webtoon world. OMG its a fairy tale which actually exist and trying to emerge in the real world. We were curious as of now what will going to happen. We have seen this teleport scenes in many kdramas. But this time it was really thrilling. Oh Yeon Joo foung herself on the top of some building. 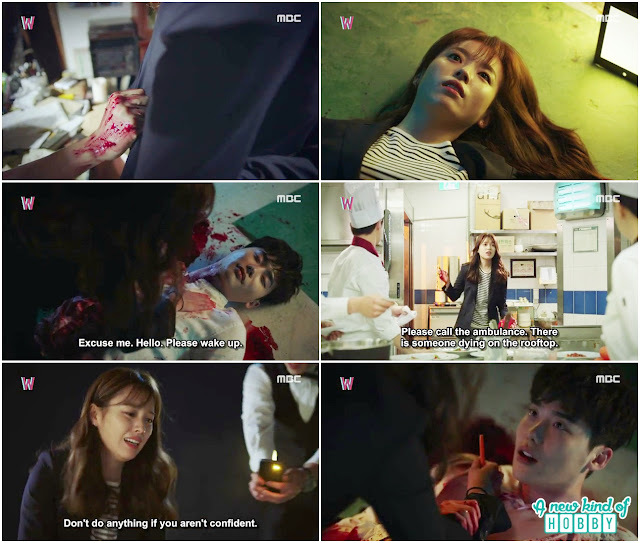 Kang chul was badly hurt. She ran down and ask for help telling the situation. Every one there also got shocked. She manage to save Kang Chul by giving the proper aid treatment. 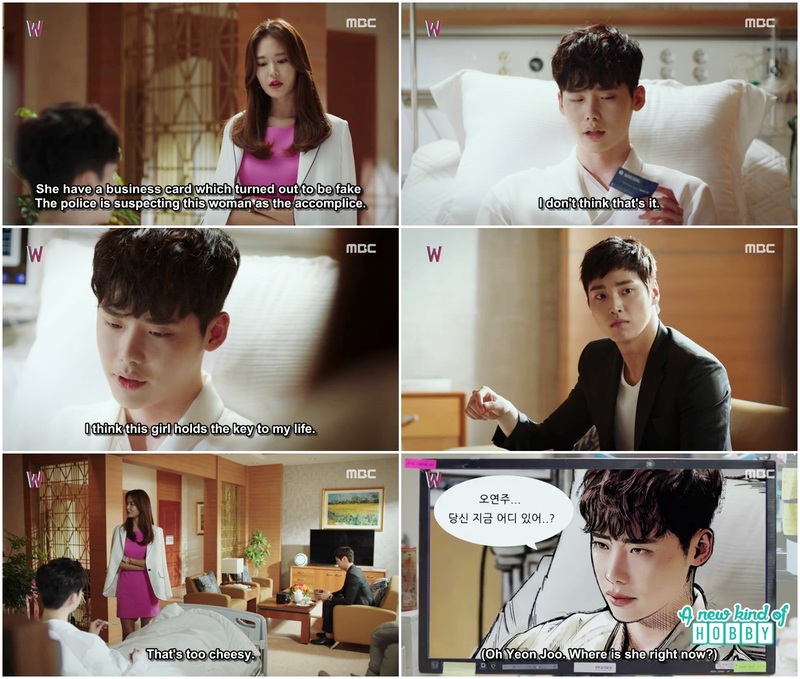 The rescue team, the hotel manager and others came and recognize the dying person as President Kang Chul. Seriously this drive us crazy what on the earth is going on. In the first scene we saw him with his family who was middle class, now he turned out to be a president. May be its a a scene of twins. Many questions and suspense was killing our curiosity. Some thing appear to be continued and Yeon Joo found herself back in her fathers office. She was confused what happened to her then she ask Assistant Bong did i go somewhere for a long time, but it wasn't it. The assistant said him not to worry he received the episode and your father was not kidnapped. Then he showed the episode to Yeon Joo, and we were surprised too it was all what happened with Yeon Joo in Webtoon world. The webtoon work soo amazing for sometime we started thinking of the real character as webtoon. The cartoonist , the writer the director all did a great job to present a master piece, a story within a story of webtoon world. 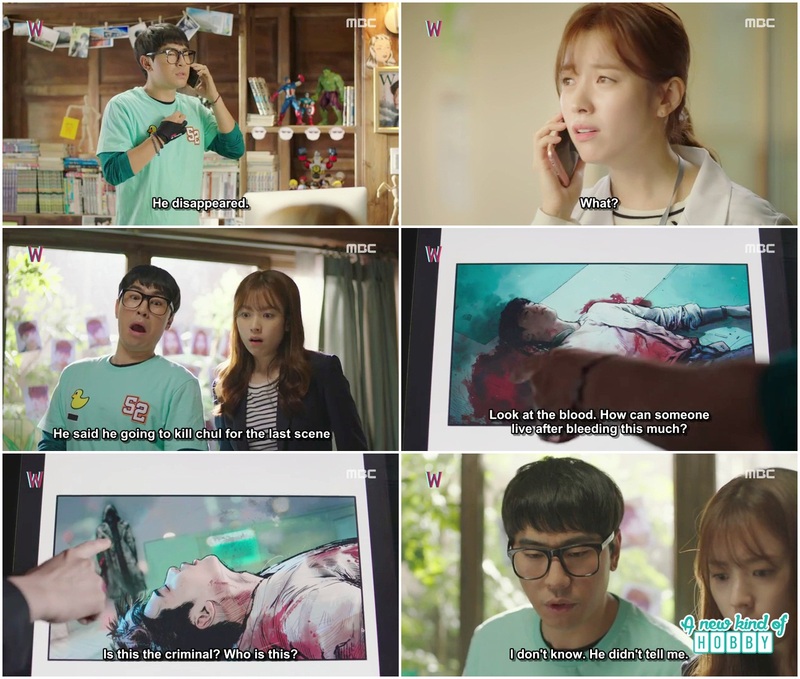 Yeon Joo along with us was shocked too see all this thing happened during her stay in webtoon world, how come it appears here the same. Did someone was watching her? What on the earth is going on. Then again we became confused with another scene. 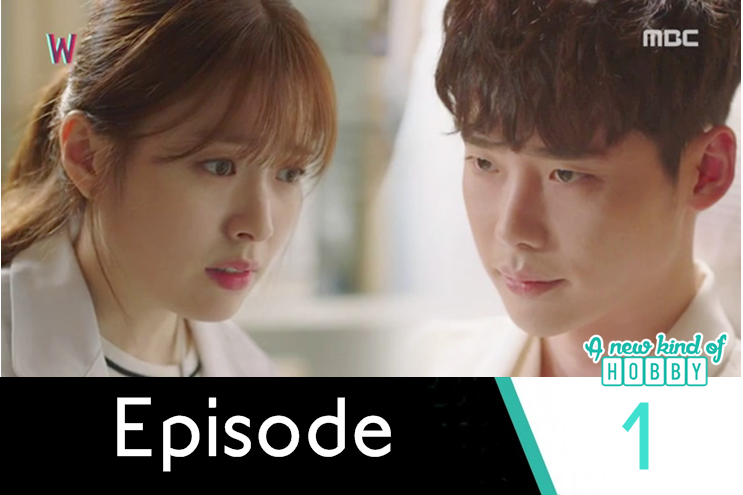 Kang chul was hospitalized and was looking for Doctor Yeon Joo. All her belongings come out to be fake, the contact number , the business card of Yeon Joo her hospital etc. They didn't exist. So we were watching the story of really "Two Worlds". In one world Yeon Joo and thing exist, in the other world Kang Chul exist. So the question which is the real world, how are they connecting and everything happen in these two world appears in Yeon Joo's father webtoon "W" at the same moment. In the real world Yeon Joo was watching the web series instead of treating the patients at the hospital. She got surprised to see all what happened actually with her. 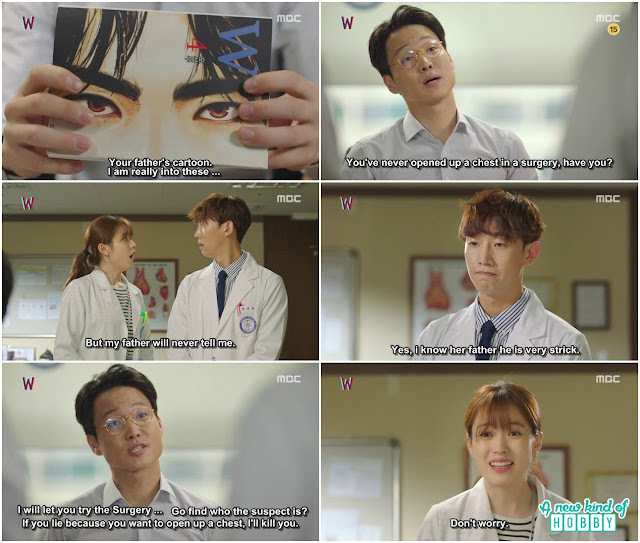 Also she was surprised to see her origional business card in the hand of Kang Chul. 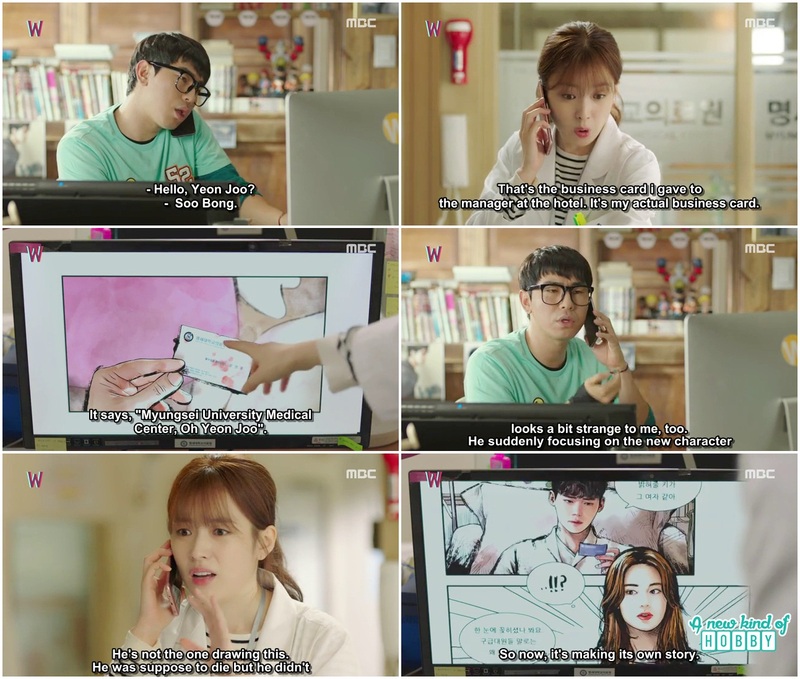 She called the assistant to confirm wether his father is drawing the webtoon or not. The assistant its him he can judge his drawings no one else can draw these characters. Yeon Joo got the point that now webtoon is making its own story and dragging this world into there. Also he was suppose to die but why it didn't happen what's the connection of me with him. Is there any one else who is controlling all this? So there were many questions we also got confused and want to be clear but the things getting more and more complicated. The first episode ends here leaving lot many unclear things and lot of curiosity. Stay tuned episode 2 to knew what actually the story is.